Jonny started with us with a quiet concern over his knee injuries and an anxiety that he wouldn’t be strong enough. These pictures show his progress in only 12 weeks and he has now become a full time Strip and Rip member. 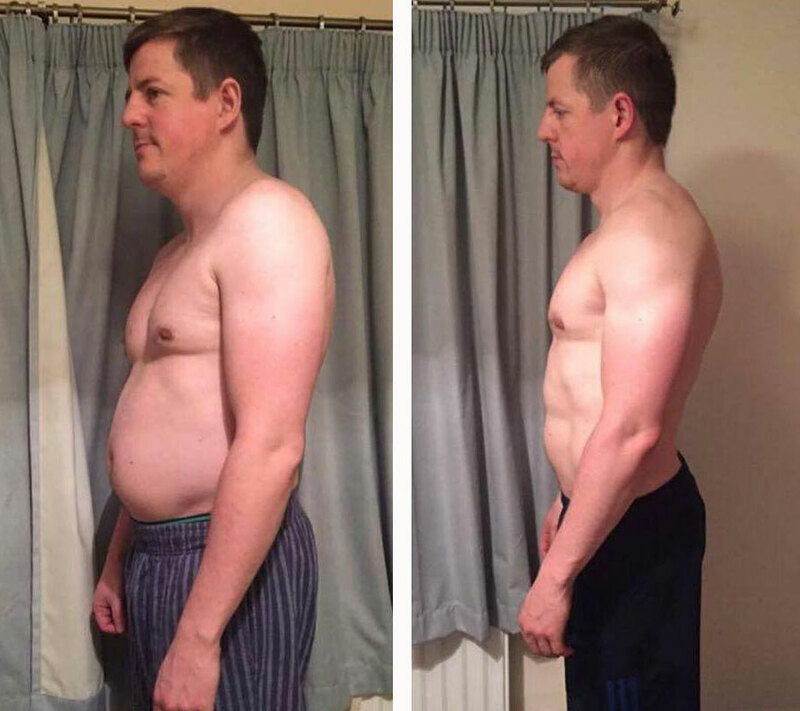 The pictures speak for themselves but his actual gains throughout the 12 weeks have been absolutely immense and some of the best or even dare we say shocking that we’ve ever seen. 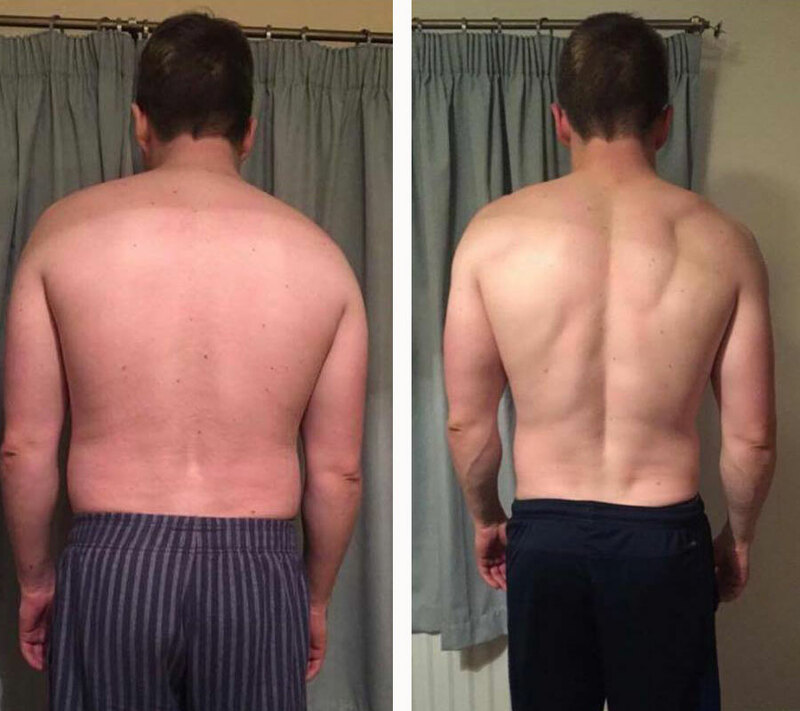 Jonny has lost 3lbs and 7% body fat in this time and has gone from 30kg to 120kg squats, he has doubled his bench and has also dead lifted 200kg! His strength is phenomenal and he is naturally gifted… We are super excited to see how much further he can go as he’s clearly got a lot more in the tank! I have always had a reasonably high level of fitness as I regularly played squash, badminton and rugby. This came to an end in Feb 2015 when I finally succumbed to a long term knee injury requiring two surgeries and a long period of rehab which I’m still in. I haven’t been able to do any sports since that horrible day and spent several months confined to crutches. So as you can imagine, my health and fitness levels took a nose dive! I had my main and final knee op in November 2015 so pretty much had to write off any activity until the New Year 2016. By this point I was in the worst shape I have ever been in and tipped the scales at over 13 stone for the first time in my life (I’m 5’8” which at this weight isn’t a great look!). To add to this problem, I am getting married abroad in August this year and there is no way I was going to be spending a week in a hot country with all of my family and friends in that poor shape! Cue a very excited New Years resolution to hit the gym hard and eat right. This consisted of me doing pretty much all cardio in the gym and just trying to eat less (No real science or forethought behind it). This worked a treat for the first 4 weeks. Then by weeks 5 and 6 I was so busy at work I slipped to just 2 gym sessions a week. Gradually my self made diet was so flaky and poorly planned that by the end of February I was back to eating exactly as I always had and I didn’t even notice it. The disappointment of not eating right fuelled the “why bother” mentality with the gym and by April I’d pretty much given up. I was really pissed off with myself and the whole situation I was in as I felt I’d tried and failed and was now left with less than 4 months until the wedding with no idea how to get in shape. Enter RT Fitness! I’m not exaggerating to say this situation was really playing on my mind and stressing me out so when I saw a very short and sharp ad on Facebook for guaranteed fitness results in Durham, I looked into it straight away. The same night I arranged to pop in to have a chat with Ross. We discussed my situation and goals as well as limitations with my recovering knee. Ross was confident he could work around my dodgy knee and we decided I should be able to handle the Strip and Rip programme and I started just 48 hours later. After my first session it was like a big weight had been lifted off my shoulders (Pun not intended) as I could immediately see that this was a clear path I could stick to and I was confident would get me the results I was desperate for. RT Fitness has a really nice atmosphere to it and everyone on the course is really friendly and approachable which makes it very easy to fit in. Any anxiety is very quickly forgotten about. I’d never done proper weight lifting before so the whole thing was new to me but this isn’t a problem as Ross and Sarah set all of the exercises up for you and they show you exactly what you need to do before you have to do it. By far the best thing about RT Fitness is the people. Ross, Sarah and Dan are all lots of fun and clearly know exactly what they are doing. Follow their lead and you can’t go far wrong and they are always there to offer any support you need. The other people on the course (and other courses) are all in the same boat as you. Its not full of meat heads trying to out do each other followed by a manly chest bump. Its just a load of like minded people who want to improve themselves but don’t really know how, so we have all turned to RT Fitness for help. We all help each other and have a good laugh whilst doing it. I frequently turn up to the sessions after work really stressed out and pissed off from the day I’ve just had and somehow, after 1 hour of training, I can leave in a good mood feeling really good about myself. It is NOT easy to turn up to every session, push yourself to lift your maximum weight all of the time and there are sacrifices with your food but you are not going to reach your goals without having to try! It Is easy in that all you have to do is consistently turn up and do what you are told and you really are guaranteed to achieve your goals. I have only dropped 3lb in actual weight during the 12 week course which isn’t an impressive stat. I could drop more than that in under a week with just about any fad diet out there. However, when you look at the measurements that matter, Ive gained over 10lb of lean muscle and dropped almost a stone of body fat. The effect of this swing in body composition is fairly evident in my before/after pics. Plus unlike a Fad diet, this is actually sustainable! I’m now in the kind of shape Ive always wanted but never been able to achieve and can go to my wedding confident and not having to spend a week sucking my belly in! I’m stronger and in better shape than I ever thought I could be and this is all after just 12 weeks. However, these courses aren’t just a quick fix. 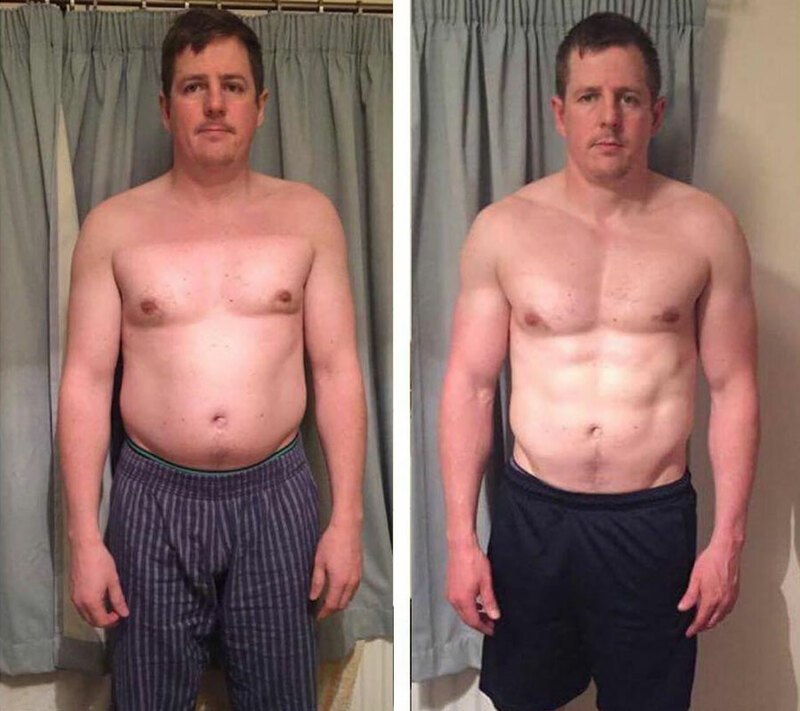 They really do open your eyes to a new way of living and encourage a long term change in attitude to food and fitness and I’m more motivated than ever to keep this going long term…I’ve achieved fairly dramatic results in 12 weeks and am really excited to see what I can do in the next few months, years….forever!